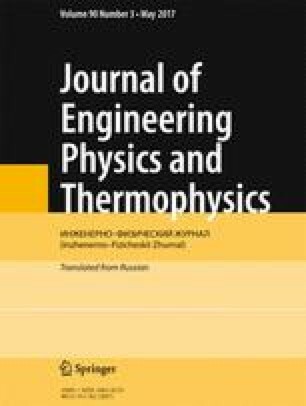 A modified generalized equilibrium model of a one-velocity heterogeneous mixture has been presented in which account is taken of interfractional heat transfer. A characteristic analysis of the model′s equations has been made, and their hyperbolicity has been shown. The Prandtl–Meyer problem and the problem on air–droplet-mixture flow past a wedge has been solved on a curvilinear structured grid using the Godunov method with a linearized Riemannian solver. Results of numerical calculations have been compared with self-similar solutions. Translated from Inzhenerno-Fizicheskii Zhurnal, Vol. 90, No. 3, pp. 610–619, May–June, 2017.